After presenting the information on the fact sheet, announce the sixth and final activity of the competition. Remind students which groups they are in. Have students sit with their groups. One point per article (or description of TV commercial or show) that discusses drug use. Two points if the article discusses the impact of the drug on the brain and body. Three points per article if the student can identify an imbalance in the presentation of the information, as in a media piece that lacks scientific background or presents false or sensational information. Use the Media Chart provided to track the teams’ progress as they gather this information and present it to their classmates. Run the competition for a few days or a week. Encourage conversation about the topics that the students present to support the integration of all the information covered in the Brain Power! curriculum. Do students realize that accurate information can support healthy decision-making? Are they aware of the role of the media in disseminating this information? Record group points on the Group Scorecard. Methamphetamine use, like the use of other drugs, impacts both individuals and society. 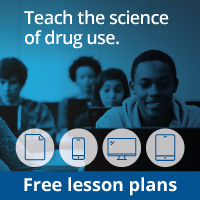 For this final activity, students will explore how methamphetamine use has a ripple effect throughout society. Using the Web sites provided as a starting point, have students research the prevalence of methamphetamine and the consequences of its production, distribution, and use. Have students complete the diagram on the Ripple Effects handout, listing ways in which methamphetamine affects multiple layers of society—from individuals to families to communities. Students should use information from the Web sites below and others to justify their responses. Then, have students brainstorm ways to prevent or improve the problems on each tier. The image below represents the Ripple Effect. Prior to the activity, add these sites to the classroom computer’s “Favorites” drop-down menu. If need be, the activity can be spread across a few day’s time by having one group at a time access the computer for research time while the rest of the class completes other work. Example: for the individual, responses may include addiction, health problems, loss of job, and jail time; for the family, responses could include violence, poverty, child abuse, and neglect; for the community, responses might be crime and pollution.